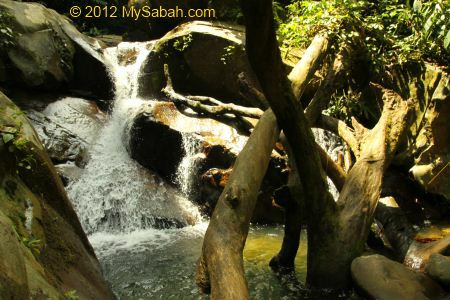 Kiansom (or Kionsom) is a familiar picnic spot to people of Kota Kinabalu (KK). 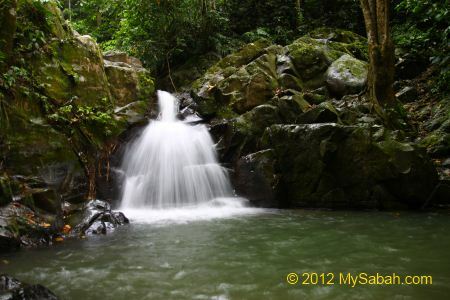 I call Kiansom a “Waterfall Park” because it has 7 waterfalls! 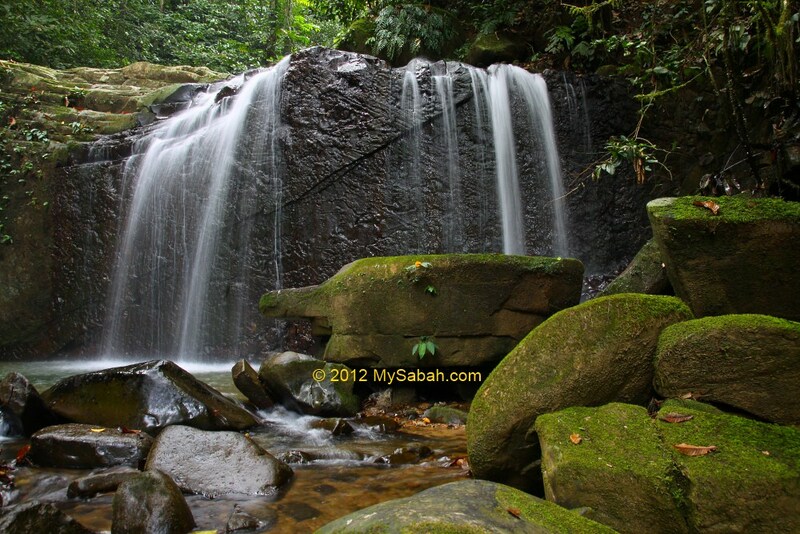 This recreational park is only 20 KM away from KK and highly accessible by paved road. Kiansom is known as “建山” in Chinese and sometimes misspelled as “Kionsam”. Important: there are a lot of mosquitoes in Kiansom. 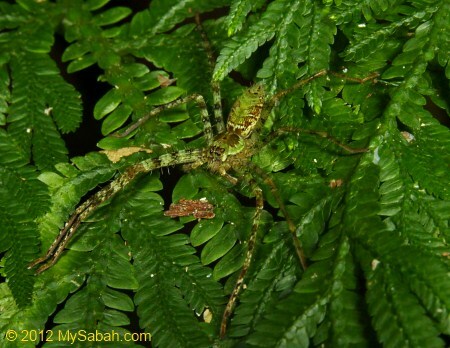 Do bring Mosquito Repellent with you. 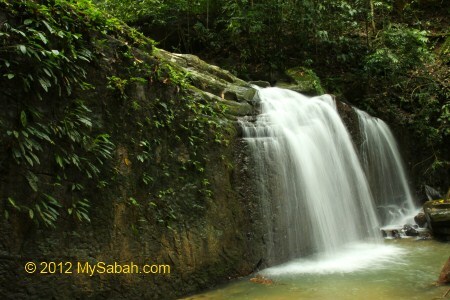 You can see 3 waterfalls of Kiansom in less than 10 minutes. FYI, there is no lifeguard in Kiansom, so you swim at your own risk. 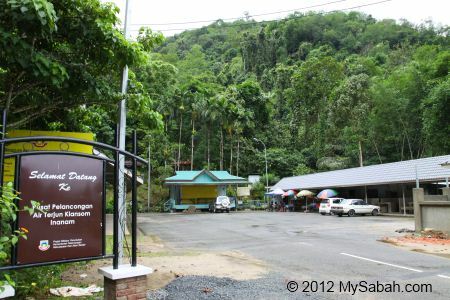 At the right of the entrance is cement walkway that leads you to first 3 waterfalls of Kiansom, where 90% of the visitors congregate for picnic and swimming. 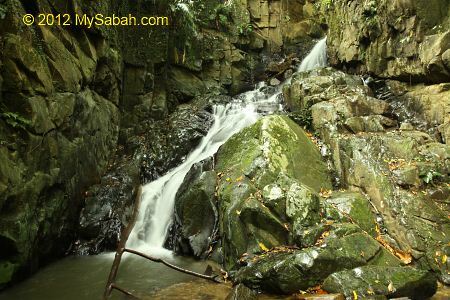 Above: the first Kiansom Waterfall. It’s so small.. 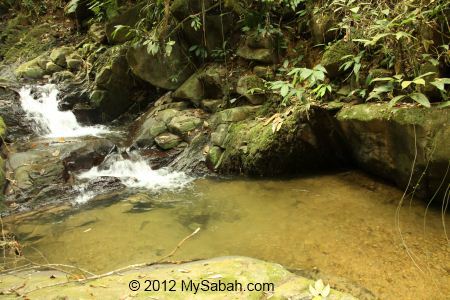 The small pond of 1st waterfall. The water is not too deep, so most parents bring their kids swimming here. 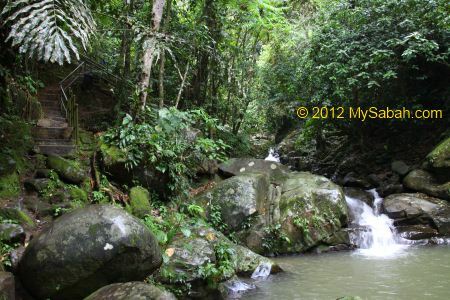 Above: a bit further upstream is the 2nd Kiansom Waterfall, not very big either.. The water here is deep and is known for drowning people occassionally. Many fearless youngsters like to jump into this pond from top. 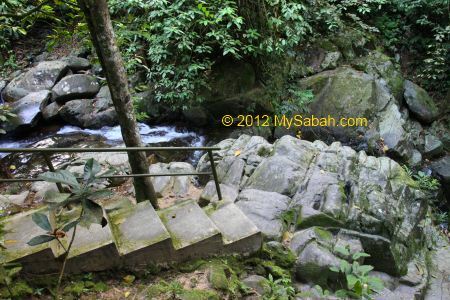 At the end of cement walkway, just walk forward a few Meters on the rock surface and you will find the 3rd waterfall. To me, this so-called waterfall looks more like a stream flowing on a slope. I’m not impressed. You see nobody in my photos b’coz I came here early morning. 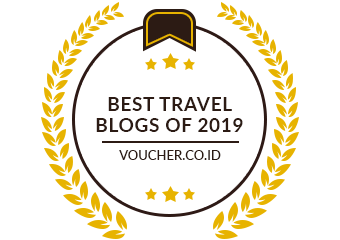 This place is crowded in afternoon, especially on weekends and holiday, as most visitors are students and family group. If you want quiet place with bigger waterfalls, you can enter the jungle. Not far from the park entrance, there is a hilly trail at the left that leads you further upstream for bigger waterfalls. 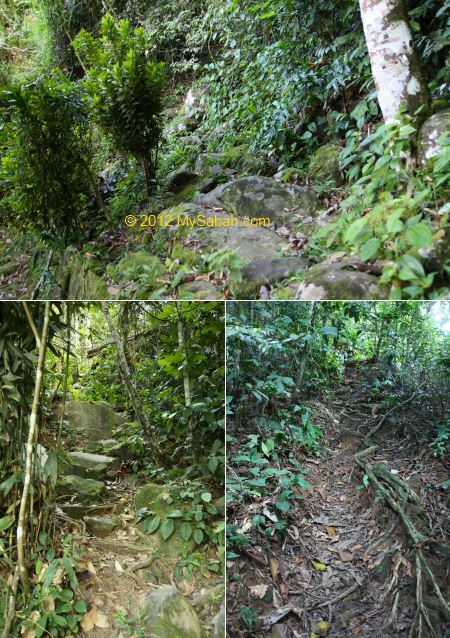 The route is not so inviting and the trail is mostly steep and uphill path. Be careful when you walk on boulders as they can be VERY slippery. The trail is obvious but there is no signage at all. 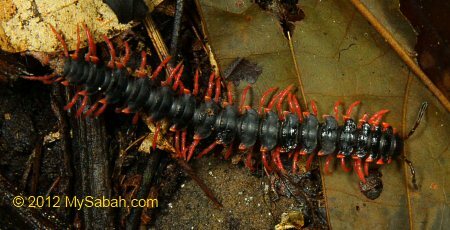 Forest leeches may present in wet season, but they are tiny brown leeches and small in number. 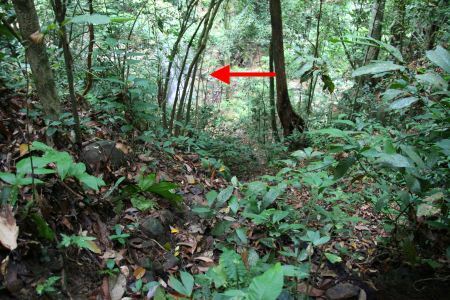 I didn’t feel really warm during jungle trekking b’coz the trail is next to the Kiansom River. There are quite a number of waterfalls and ponds along this cascading river. The water looks so clean and fresh that I was tempted to take a dip (and let those at downstream enjoying my bath water LOL). I was not alone in the river. I can see many tadpoles and sucker fishes in the water. 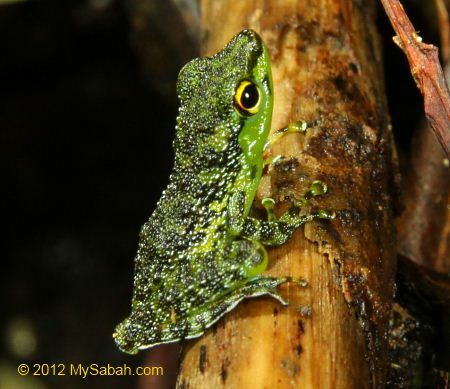 The Black-spotted rock frog (see photo above) is quite common here. 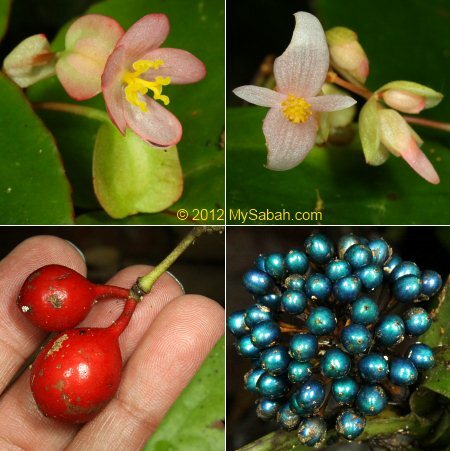 Since I was walking on jungle trail, I saw some flowers and fruits along the way. 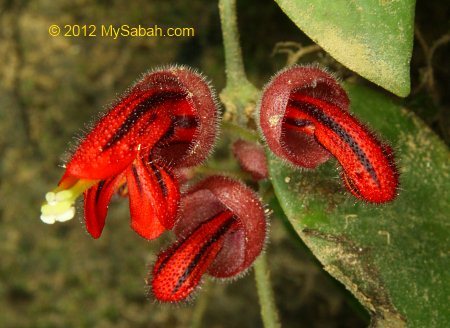 Like the “red-nosed” flower above. The flowers are quite small in the wood. Can you name them? Then I saw a very interesting tree next to the river. 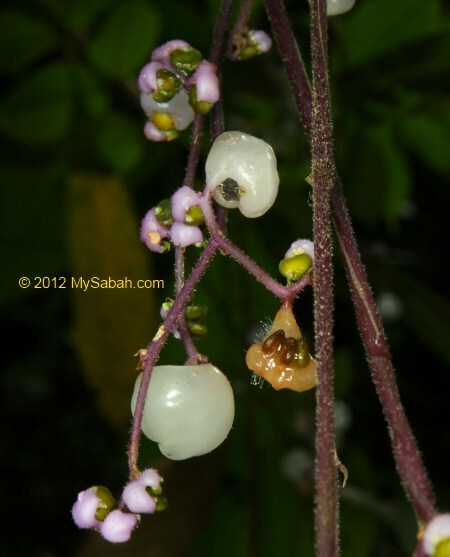 It has pink flowers and translucent fruits, so cute… The fruits are above my head, so I grabbed their hairy stems to pull down for a closer look. A few seconds later, my fingers felt like being poked by many needles continuously, really hurt… the nasty pain lasted for over 10 minutes then subsided gradually, but the tingling sensation remained for hours. I used sticky plaster to stamp on my fingers to pull the venomous hairs out of my skin and that really worked. After 15 minutes on the trail, I saw a big waterfall far below. That must be the tallest waterfall of Kiansom. Climbing downhill to this waterfall is quite dangerous as it is steep (more than 50° inclination). Anyway, I struggled climbing down 30 Meters for 10 minutes and reached the waterfall finally. 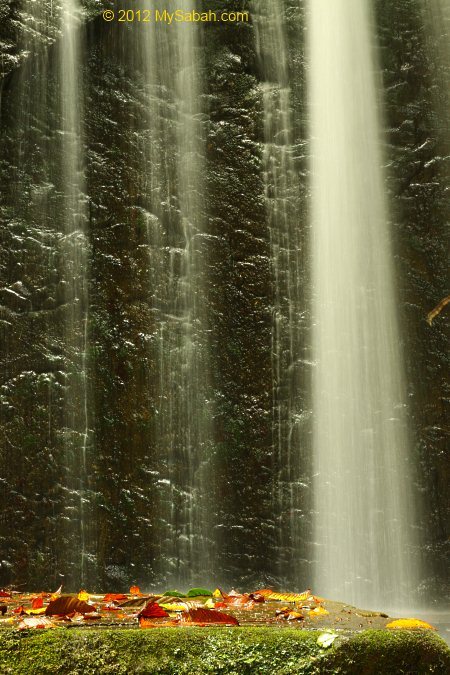 This waterfall is over 20 feet high, though it looks small in photos. 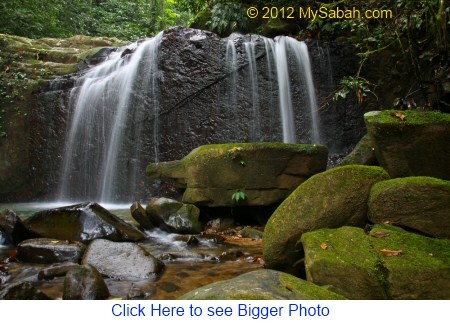 There is a smaller waterfall downstream that makes a lovely shot with the big waterfall behind. You can click photo above for bigger picture. The cliff of this waterfall has very interesting rock face. 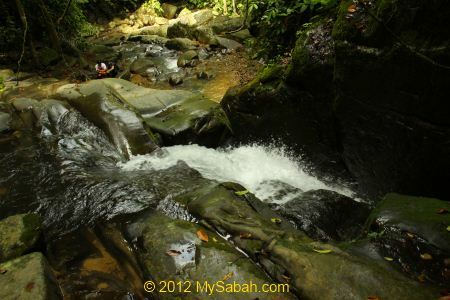 Below are a few other waterfalls that I saw along this 1-KM jungle trail. 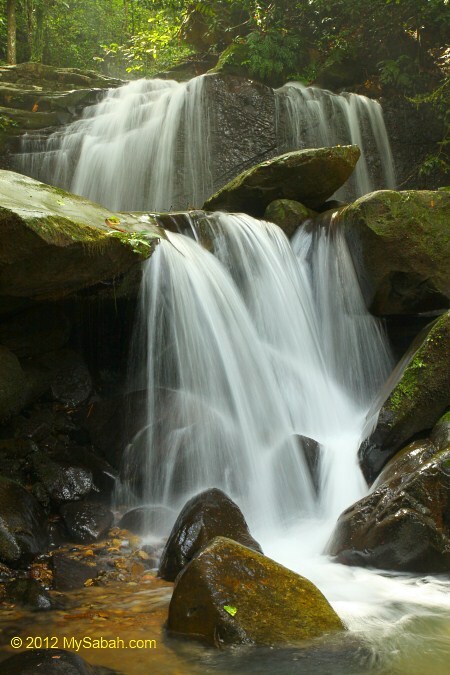 Above: 7th and last waterfall of Kiansom. Warning: Everyone loves waterfall and can’t wait to dash into it when they see one. 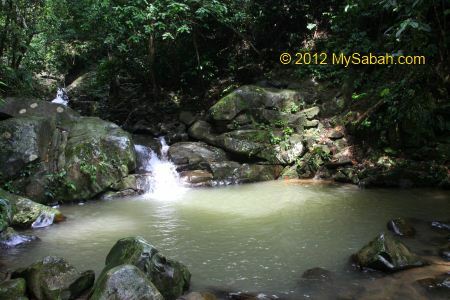 However, waterfall is a beautiful death trap even for experienced swimmers. 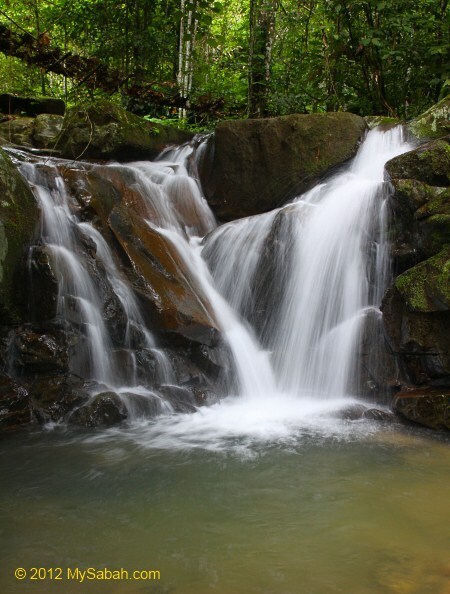 Be extra cautious not to swim right under waterfall, as the water can be deep and swift. The falling rock from top can cause serious injury too. Stay away from waterfall during heavy rain, due to possible occurrence of flash flood. A small boy was washed away by flood here in 2010. 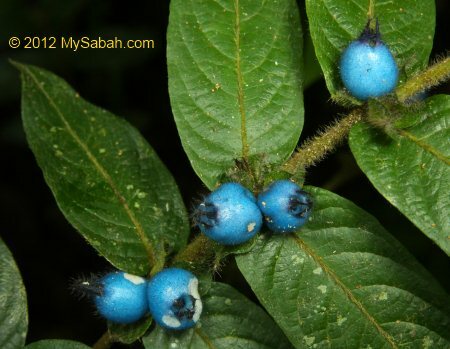 The jungle trail is flanked by dense wood and shrubs, and you can spot interesting bugs among them. The variety is not as good as primary forest, but you still can find cool creatures. 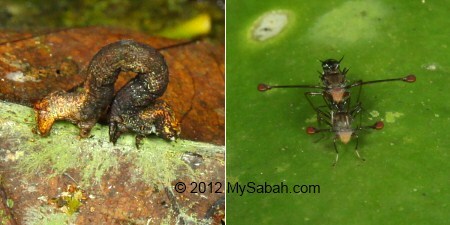 Note the mating Stalk-eyed Flies at the right in photo above. 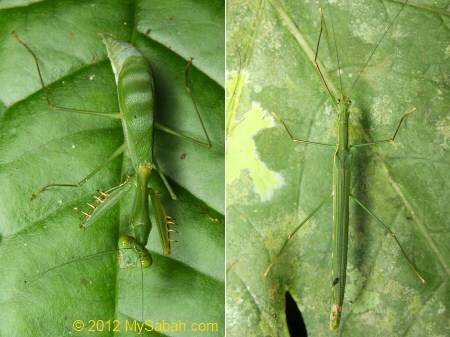 The wider the eyestalks of the males, the sexier they look to females hence better chance to mate. 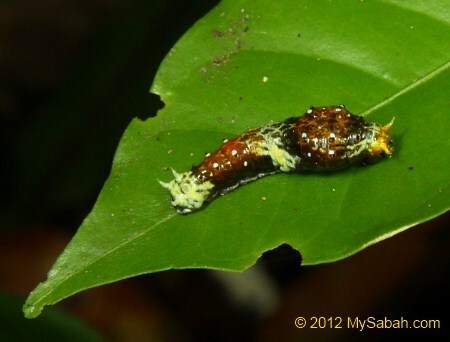 Above: a swallowtail butterfly caterpillar (species: Papilio polytes) tries to look less tasty with its bird dropping appearance. I saw Rajah Brooke Birdwing Butterfly and Green Tree Lizard, but they fled before I took picture. Kiansom Park is open for everyone and it has basic public facilities. However, they don’t seem to have electricity supply. 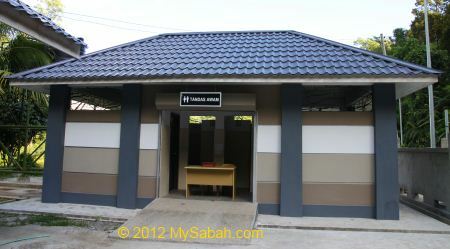 Kiansom Park has a public toilets (male & female). 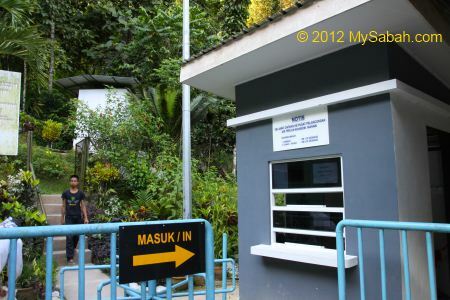 It’s only RM0.20 per entry, RM0.50 if you take a shower. The toilet is reasonably clean, but the floor is always wet. No toilet paper is provided so you need to bring your own. There are a few small stalls that sell drink and snacks in the park. They usually open after 8am during weekends. Food stalls that sell simple food such as burgers and Nasi Lemak (rice with anchovy fishes) are open after 9am during weekends. 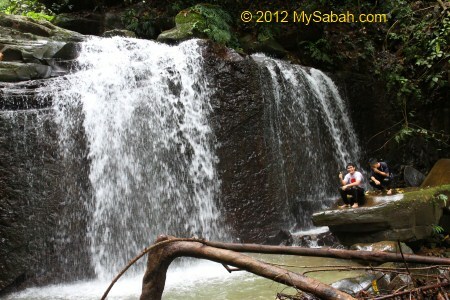 Kiansom is important as it is the nearest place where KK folks can enjoy waterfalls and nature view. However, the rubbish is such an eyesore to those who come here to enjoy the clean air and water. 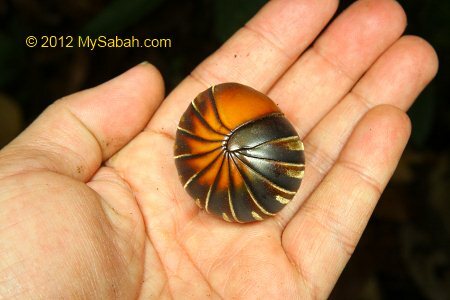 Sabah has the most beautiful nature in Malaysia, but we also have the most Litter Bugs in Malaysia. 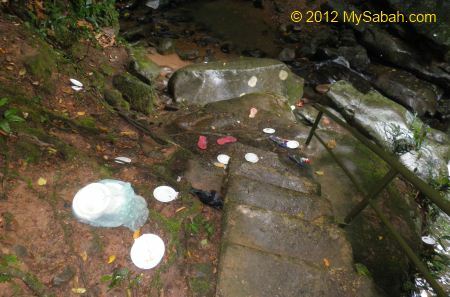 I also saw many candy wrappers and mineral water bottles along the jungle trail. I believe most garbage are from school kids. What did your schools teach you huh? Do they fill your brain with junk? Throwing rubbish is an act of low life. Keep our environment clean and don’t be “kurang ajar” (lack of upbringing).